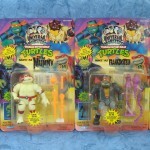 For our Featured Ebay Auctions, we take a look at some of the classic Teenage Mutant Ninja Turtles Action Figures. From the original Party Van to a Rock ‘Em Sock ‘Em set to the Turtles as Universal Monsters. Check them out below.